This life is full of ups and downs. There are moments when it seems as if you’re touching the hem of heaven because they’re so dazzling. And others when it seems you stand on the brink of hell because they’re so heart wrenching. We can tend to feel far away from God in both. When times are good, we forget how much we need him. When times are hard, we wonder why he has forsaken us. And yet both of those responses are only are humanity talking. God’s affection for us is the same at the highest and lowest moments of our lives. The heights of success and the depths of despair cannot separate us from him. His love is the one constant we can count on no matter what. 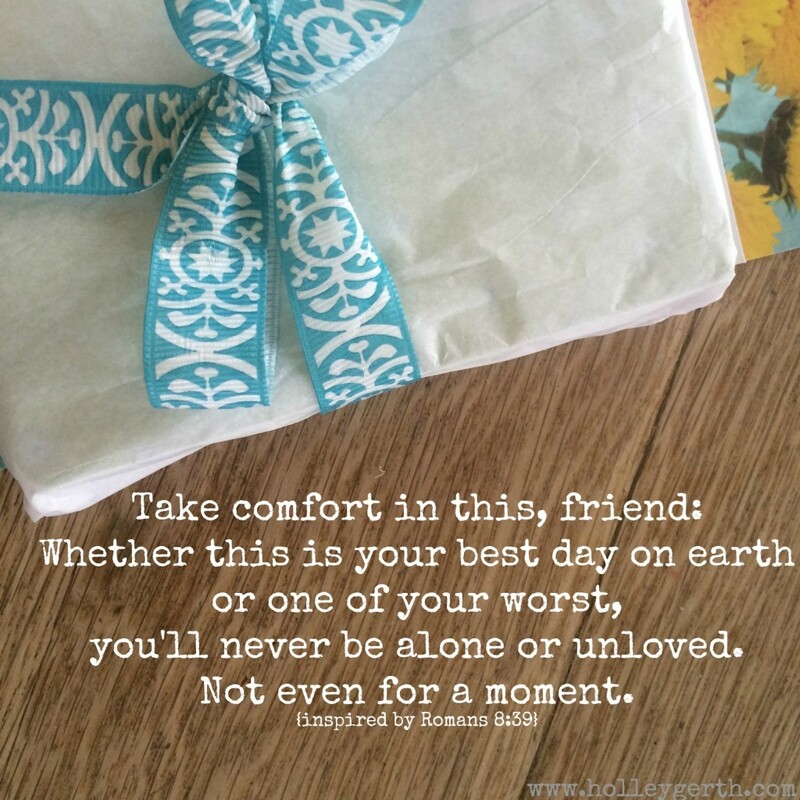 Take comfort in this, friend: Whether this is your best day on earth or one of your worst, you will never be alone or unloved. Not even for a moment. What a blessing that I found you on the web. I treasure your words. Thank you so much, Holley. Thank you, Holley. Today is starting out weepy. I needed to be reminded of His constant love no matter what. Your e-mails always mean a lot to me but even more so this week. Last Friday I found out that the job I was to have until I get Medicare in November was no more. I was told that I could not work the 32 hours a week that had been discussed with me. I could either choose a job in another clinic, work flex (maybe 1-2 days a month), or resign. I was very upset of course because I thought I had a job until November. I chose to resign. I will get my first Social Security check this month but want to work part time or temporary jobs. I need everyone’s prayers. I am no longer upset but feel that this is God’s will for me. God bless you Greita – hang in there. Instead of the human tendency to wallow in self-pity, bitterness, or anger at your circumstances, you have chosen to trust Our Creator in his infinite wisdom. You know He has a plan for your life and future;embracing His will takes faith and strength and you will surely be blessed by Our Father. Praying for you! May God brings you a job much better than the old one. I know how you feel, but as Holley mentioned here, you are always loved, no matter what. God never forsake us sis. You have my prayers. Good morning Holley. I’m glad I found you too. The words that God prompts you to share really touch my heart. I’m at a point in my life where I know that my relationship with God ought to be better than it is but I find it hard to concentrate enough to pray or study the Bible for any length of time. I feel like God is always near me, waiting for me to turn to Him, but I try to do it all on my own. You’d think that the fact that things don’t go well when I do that would push me to rely on God more. Instead I feel like even more of a faiure. It’s hard to move the understanding from my head to my heart on a regular basis. Thank you for sharing this in this exact moment. I needed to read it as I’m dealing with a touchy issue with my husband & his kids. I’d ask prayer from you all that read this that God be #1 through it all & my husband wouldn’t see me as an opponent, but rather on the same team. Thank you all! I have been there and I think I know how you must be feeling…..
You will be in my Thoughts and Prayers are UP. Please lean extra hard into Jesus as you and your husband work together, in the name of God, to be on the same team. It is SO worth it and you will reap the rewards!!! What a beautiful prayer request! How can I not pray for you? Lol. In the midst of trouble you are asking your sisters in Christ to pray that you will remember that God is #1 and your desire to work as a team player with your husband. I believe this kind of request pleases God so much! You seem like such a kind, sincere person who is committed to The Lord. I will pray for you and I consider it an honor to do so. Last Tuesday was amazing. We welcomed our first granddaughter into the world to join her brother and cousin as our third grandchild. God was smiling at me and I felt wonderful. Last Friday, I started having car problems, looks like I need a new engine. Highs and lows… I know them well. It’s so easy for me to respond with words of compassion and verses when a friend is in this situation, but so hard to remember them when it’s me! So glad you’ve got me covered Holley! Holley you are so good at hugging people with your words! Thank you so much. What an wonderful reminder of a simply awesome truth!! Experienced both high and very low this week. Found God to be closer in the low than in the high…one of those times when He was especially near and I could see Him working. Sometimes He does seem distant, but I’m thankful for the times when He lets us get a peek of His glory. And in so doing, He turns a low into a high. Thank you for your encouraging words! Saw your blog and took the picture and forwarded it on to several people some of who are going thru a bad time. Enjoy your blog and it builds me up. Holley, thanks for all you do to encourage women. We all need it. Blessings to you! Such words of truth! I’ve lived long enough to certainly know this. Thanks for speaking the truth!!! Hi Holly Lena said your words are like a big hug. I agree. I have a ongoing disability I get very dizzy, foggy head and nausea. That can be such a struggle in itself. Now I have a gluten sensitivity to make a long story short I have been unwell for a few weeks. When I read what you wrote today I felt like you hugged me. I really needed that today. Please continue to write the words God puts on your heart. I’m so blessed by you. Today I read your post a few times through out the day. It helped me to be reminded of God’s love. You are such a special person and God loves you so much too. Thanks again !!!! Holley, these words were music to my ears tonight! Thank you! God bless! Holley, Thank you for the words of encouragement. We all need reminders of the awesomeness of God’s love toward us, especially on those “low” days. Today, I’m having a mid-to-high day and am consciously preparing my heart to hold fast to the truth you’ve shared in an even deeper place in my heart. It will be there if I doubt on the low days. Btw, I really liked what Lina said, you are very good at hugging people with your words. And, Lina, apparently is too, what a beautiful expression! Hello Holley! How are you today? What do you think of marriage (a man & woman of course). For me I define it the Biblical way: Man is the head of the wife as Christ is the head of the Church! In my marriage to Mike, Mike is the head as Christ is the head over the Church. The Twitter/Facebook ministries have tried so hard trying to help some people, who happened to be ladies like myself. They want me to be successful, without talking to my husband. I don’t drive a car, Mike does. I don’t have a car of my own to go around places, to have a business, a ministry, etc. ! Not knowing how to drive a car is number one setback in life! However, having a husband who is your car driver is wonderful! Having a business or ministry Mike has to say, it’s okay! Without him saying it’s okay, nothing will truly be done. God has in His heart for me to help the young people, to show them Jesus. This is ministry! What I’m saying is that Mike takes the lead all the time in nearly 13 years now. I am not the boss in my home, Mike is! It’s best to allow the Lord to minister to the husbands too! Ministries must not force things to happen when dealing with ladies/sisters in Christ & it’s best to leave us! God in His sovereignty knows more than any human can do. I was especially touched by these words today. My husband of 40 yrs just learned days ago that his job is being phased out and he finds himself semi-forced to go ahead with retirement plans several months ahead of schedule. I am the bill payer and finance keeper of our family and should be in panic mode but oddly enough I am totally at peace with what lies ahead. I total trust in my Lord to provide and I know we will be ok.
Holley. I have been following you for awhile & have your book You’re already amazing. You will never know how much you have blessed me/ ministered to me. Thank you for sharing your heart. God Bless you abundantly. Love having Coffee with you in the mornings! Your post has me thinking about the parable Jesus told about the foolish man building his house on sand and the wise man building his house on rock. I error on the side of foolishness when I build up thoughts and plans on the shifting sands of circumstance. What I need to do is construct a mindset-foundation on the absolutes, beginning with God’s constant love. Thank you, Holley! Holley, you always have the word that encourages me. You have a tender heart and are sensitive to the Holy Spirit. Thank you for speaking the Father’s heart on His unconditional love. I remind myself that nothing surprises my Father. He is the same. (Hebrews 13:8) my life verse. I have been in Romans 8 especially verses 37-39. I am so thankful that I am able to memorize Scripture. This is one of the passages I meditate on, especially on the days when I feel defeated. My emotions will definitely lie to me and I have to be sure I take everything to my Father. I say, “Father, speak to me” and He does. It is so easy for me to look at my circumstances or pay too much attention to my feelings. He leads me to His Word. The Truth sets me free! God bless you and yours. May He meet the deepest needs of your heart. Holley, dear Sister in Christ, it’s almost as if you’re speaking the words from my very own heart … and I thank you for doing this for me and for JESUS! Thanks for your words of encouragement. Even though I study d bible daily and pray, it seems like everything is working against me. But your words just sooth my pains. God bless you in Jesus name!